Most Holy Trinity, Godhead indivisible, Father, Son, and Holy Spirit, our first beginning and our last end, You have made us after Your own image and likeness. Grant that all the thoughts of my mind, all the words of my mouth, all the affections of my heart, and all my actions be always conformed to Your holy Will. After having seen You here below in Your manifestations and by faith, may I come at last to see You face to face in the perfect possession of You forever in heaven. Amen. 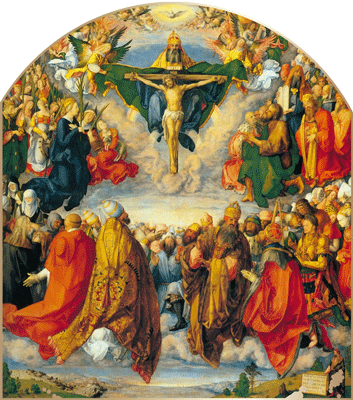 Almighty and Everlasting God, by the profession of the true faith, You have given us, Your servants, grace to acknowledge the glory of the Eternal Trinity, and in the power of Your Divine Majesty to worship the Unity. We beg You to grant that, by our fidelity in this same faith, we may always be defended from all dangers. Through Christ our Lord. Amen.